As Malaysia becomes more recognised as an international tourist destination by non divers and divers alike so Redang Island is becoming a more popular diving destination. Locals have know for years that Redang has excellent dive sites and marine conservation is taken seriouisly here so there is no reason for that to change. 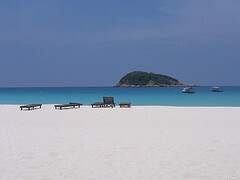 Redang Island is reached by plane or ferry boats from the mainland which take about 45 minutes. Accommodation can be simple beach huts or more up market resorts. Redang diving is by local daytrip dive boat and is normally booked on arrival. The diving season is from March to September. There are several dive sites, mostly around small islands off the south and east sides of the island. There are dive sites to suit beginner divers as well as the more experienced. Marine life ranges from amazing macro critters to large pelagic species like manta rays and whale sharks. Visibility can be as good as 30m. Tanjung Tokong is located on the north tip of Redang Island close to Turtle Bay so it’s no surprise that turtles are always seen at this dive site. Both hawksbill turtles and green turtles are seen here. The dive site is a collection of submerged boulders down to 30m deep. Currents can be strong around the boulders which attracts bigger hunting fish such as trevally and barracuda that come in to feed on the bait fish here. Schools of snapper and fusilier hang around the boulders as do sweetlips, pufferfish and moorish idols. Boulders create caves and swim-throughs that are worth exploring for lionfish, scorpionfish and lots of nudibranchs. A torch is useful in the caves. Visibility ranges from 10m-30m. Pulau Lima located 20m boat ride east of Redang Island has several areas worth diving but the best spot is called “Big Mount” and lies 80m off the island’s northern tip. It is a submerged sea mount that drops down to beyond 30m. The presence of strong currents attracts larger pelagics like barracuda and trevally. Whale sharks and manta rays are sometimes seen here, usually in the early months of the season. When visibility is good this is an excellent dive site with all the usual marine life that can be seen around Redang dive sites present in big numbers. Black tip reef sharks can be seen in the deeper areas. To the south of Pulau Lima is another boulder dive site with caves and crevices that provide a habitat for a vast array of marine life. This is a good macro dive site with lots of nudibranchs and crustaceans, moray eels and smaller reef fish. Chek Isa is a submerged reef just south of Mak Cantik on the east side of Redang Island. The reef starts at 8m and a mooring line guides the way if necessary however currents are not normally strong here so a free descent is usually possible. Maximum depth is just 20m. Most of the site is boulders covered with coarls, encrusting sponges, sea squirts and crinoids. Reef fish are prolific and smaller critters like nudibranchs, cowries and shrimps. The prettiest part of the dive site is the shallow top area where two boulders form a valley that is filled with soft corals and anemones. Sunlight shining on the top of the reef makes this a great spot for photographers. Check Isa is also a popular night dive location when crabs, shrimps and painted rock lobster can be seen and parrotfish are sleeping on the reef. Pulau Kerengga Besar and Pulau Kerenga Kecil are two islands that offer good shallow diving. With a maximum depth of 18m and weak currents this is a good area for training dives and night dives. Visibility is between 10m and 20m. The best coral is in the channel between the two islands where healthy hard and soft coral formations provide a habitat for schools of reef fish. Stingrays can be seen in sand patches. Pulau Ekor Tebu is normally dived around the northern edge where boulders drop from the surface down to 25m. The rocks are covered with hard coral formations including staghorn, table, brain and pore coral. Black spiny urchins, sea cucumbers and sea stars cling to the rocks, as do feather stars and sea whips. Stingrays can be seen in the sand at the edge of the reef. Titan trigger fish nest here and can be aggressive if they feel that their territory is being invaded. Reef fish include parrotfish, pufferfish and porcupine fish. Schools of squid can be seen over the reef. Eagle rays are sometimes spotted. There have even been rare sightings of bowmouth guitar sharks. Visibility averages about 15m here. Pulau Ling is a small island with two large coral bommies which are reputedly the largest in the Malay peninsular. They are over 100 years old and the largest is over 25m wide. Maximum depth is 20m. The coral head are home to masses of marine life including angel fish, butterfly fish, sweetlips, pufferfish, parrotfish and moorish idols. Terumbu Kili is a rocky dive site off the southern tip of Pulau Pinang. The channel between the island and the outcrop is 20m deep and is prone to strong currents coming through. In the currents it’s possible to see black tip reef sharks as well as barracuda and hunting trevally. To the north of Pulau Pinang is an old wreck that is covered in coral, encrusting sponge and reef fish. Lionfish and scorpionfish are resident in large numbers. The wreck is home to schools of small reef fish.